If you’re growing rhubarb in Minnesota this year, chances are good that it is bolting, or flowering this month. Our May has dished a heatwave of temps compared to a typical spring, and just like other cool-weather-loving crops, rhubarb bolts in those conditions. 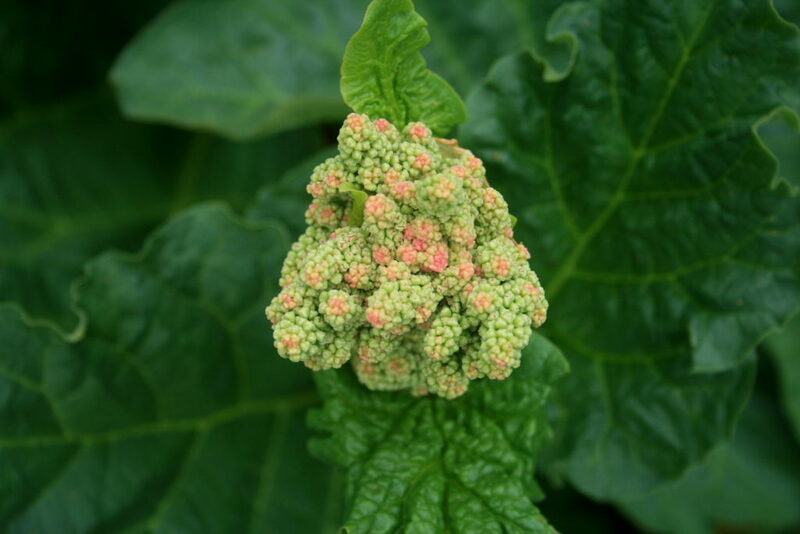 However, unlike your lettuce, it DOES NOT mean your plant is done for, or inedible once you see the flower stalk. Chop those flower stalks back and you’ll still be on a sweet road to an early summer of rhubarb custard, or a year full of tasty rhubarb orange marmalade and rhubarb liqueur! 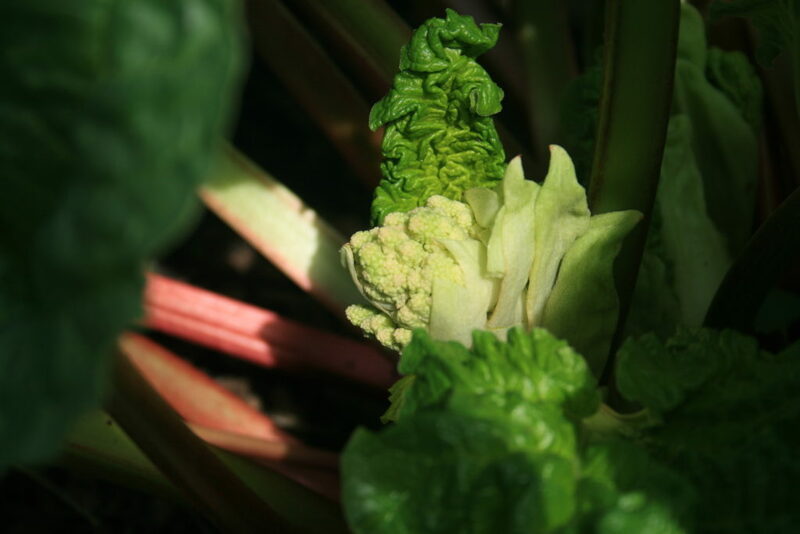 It’s actually quite common for a rhubarb plant to flower, especially if you have a well established cluster. I get a few stalks emerging every year now. However, with this year’s heat, I had too many stalks to count. I did an initial cutting back of stalks, maybe ten of them. One week later, my bushes looked like this! Here I am hauling my second armload of flower stalks away from the rhubarb patch! Wow, so many this year! Why bother to cut the flower stalks? It takes a lot of energy for a plant to produce a flower stalk and eventually seeds. If you don’t plan to harvest your rhubarb, let it flower away! The show ought to be beautiful. 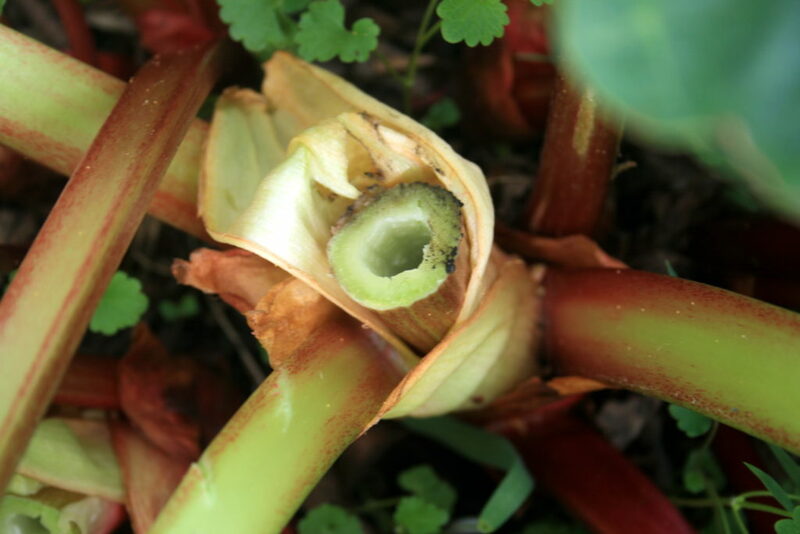 If, however, you want a solid harvest of rhubarb stems, cutting the flower stalk back will channel the plant’s energy into production of those prized stems, instead of seed production. 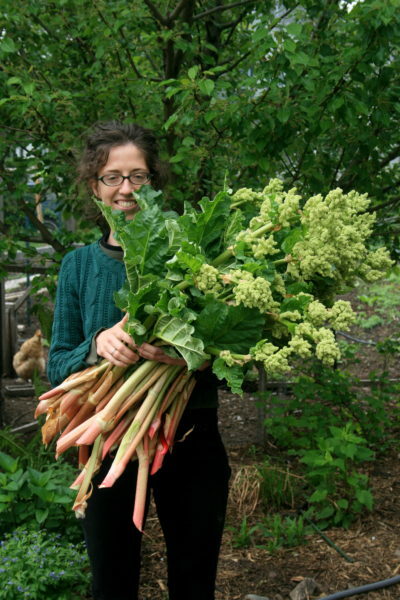 I feel that I have more control if I go into my rhubarb plants with a knife and cut the flowering stem off as high up as possible to get the flower, but not take all of the rhubarb stems attached to the flower stalk. Some people find that they can give the flower stalk a twist and a tug to separate it from the base of the plant, similar to how you might easily do this to harvest stems. In either case, remove all of the flowering stalks from your plant. 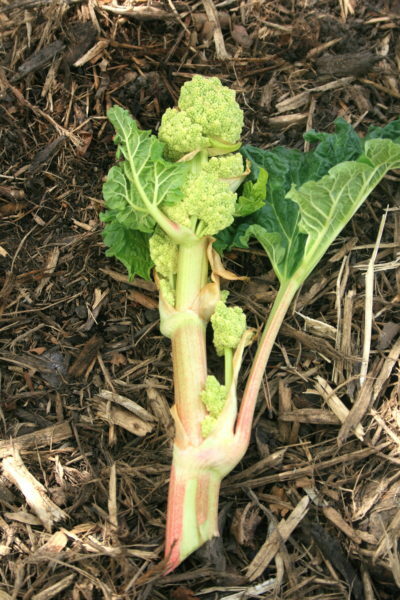 The attached rhubarb stems are edible as usual. In this photo to the left, you can see one worth keeping, on the right side of the flower stalk. The sooner you can cut out the flower, the less energy the plant puts into producing the flower stalk. If you’re early enough and dig around in your rhubarb bush, you will see big pods, or barely emerging flower heads down in the plant. You can cut these right away before they’ve had a chance to grow tall. One way to reduce your plant’s tendency to flower is to divide your mature plants. I suppose it could be said that this makes the plant feel young again! This is best done in the fall. Here’s what is left on the plant where the flower stalk was once growing. You will notice the rhubarb stems below the cut line that I left to grow a little longer and eventually harvest. They are unaffected by the flowering stalk that was there. 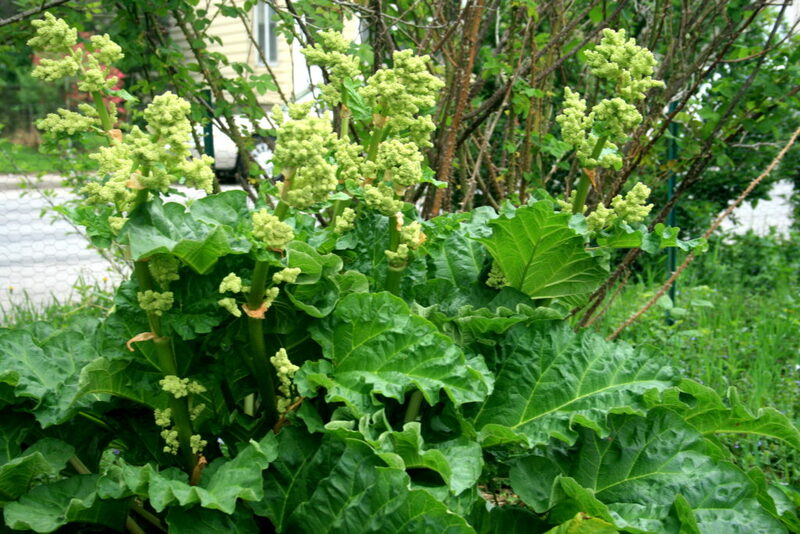 Have you had excessive flowers on your rhubarb plant this year? Have you ever left the plant to flower for a season? So helpful and timely. Thanks! Oh I’m so glad! Thanks for reading, and enjoy your rhubarb!